Employee Income of Biopharmaceuticals, Medical Devices, & Health Services Industry Cluster | Propel L.A. 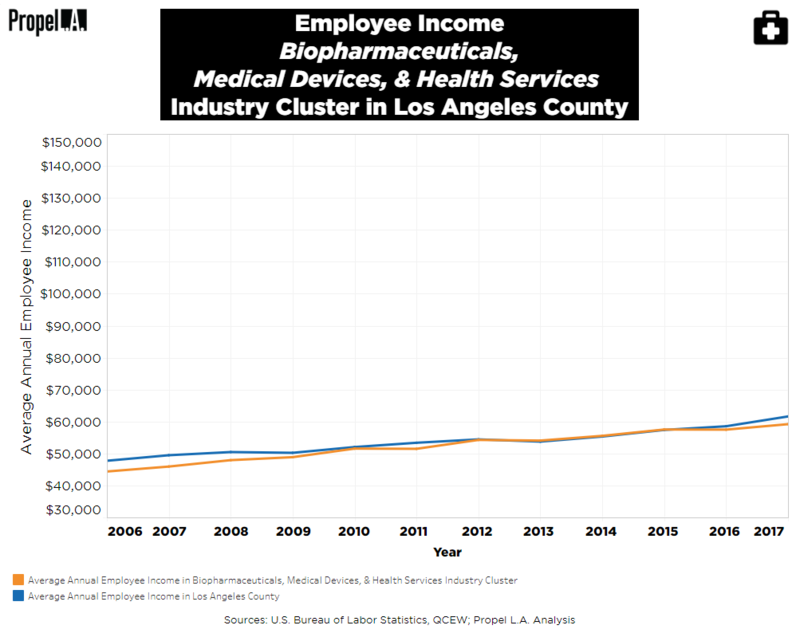 In Los Angeles County, the average worker in the Biopharmaceuticals, Medical Devices, & Health Services industry cluster (“Bio”) has historically made about the same amount as the average worker in any occupation. Most recently, in 2016 and 2017, the average worker in the Bio industry earned slightly less income. However, the 2017 wage of $59,186 is still more than double the living wage of $28,163 needed for a single individual to cover their basic needs in Los Angeles County. What is the Biopharmaceuticals, Medical Devices, & Health Services industry cluster? The Bio industry cluster is one of the key industry clusters in Los Angeles County, and it is composed of the three separate smaller industry clusters in its name, including two traded and one local. Average annual income was calculated in nominal wage by taking the weighted average of all private wages in the selected NAICS industries. Due to large population size of NAICS industries in the Bio cluster, Propel L.A. selected five through random sampling to represent this particular cluster. Note that the summary of results may be slightly biased due to the NAICS industries being nonexhaustive. Lastly, annual living wage is determined by the MIT Living Wage Calculator under the assumption that an individual works full-time at 2,080 hours a year.